At least two different Proteus 2000 models where produced throughout its production run. Those I’ve encountered have very different main boards with many parts changed, including DAC used. What s seems to be the oldest units, main board has E-MU logo and silk screen dated 1998 have different DAC's for MAIN's and SUB's outputs. 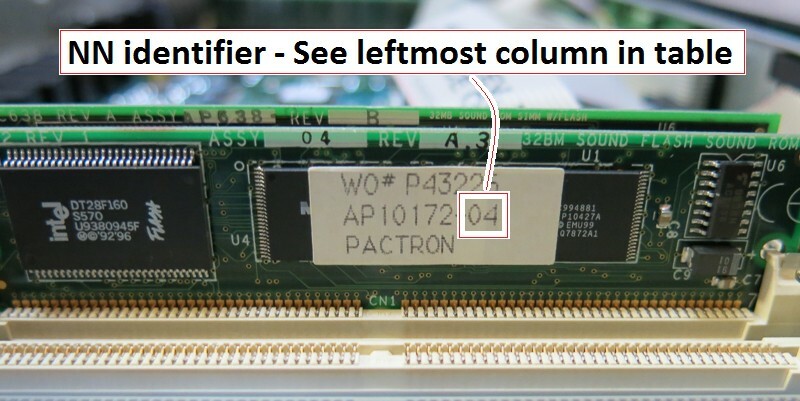 Later units has Pactron labels inside and year 2000 on PCB silk screen. MAIN/SUB1/SUB2 on these came with AKM AK4324 (Dual 1bit [24-bit delta] 128x oversampling, 105 dB dynamic range) and JRC4560 op-amps. 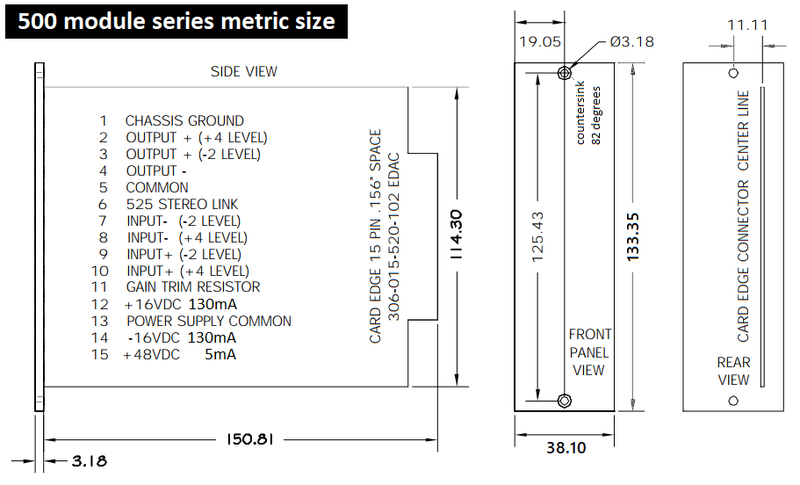 According to datasheet's DAC’s on the older boards SUB out's have 2-3dB better headroom than the CS and AKM. How much practical impact this has on sound quality could be interesting to investigate. Personally being a sucker for R-2R DAC's in my hi-fi a proper blind test is needed to rule out a favorite. 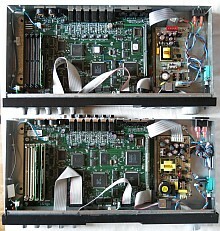 S/PDIF out will bypass these MAIN DAC's if one want to color sound through favorite DAC, or go digital strait to DAW. 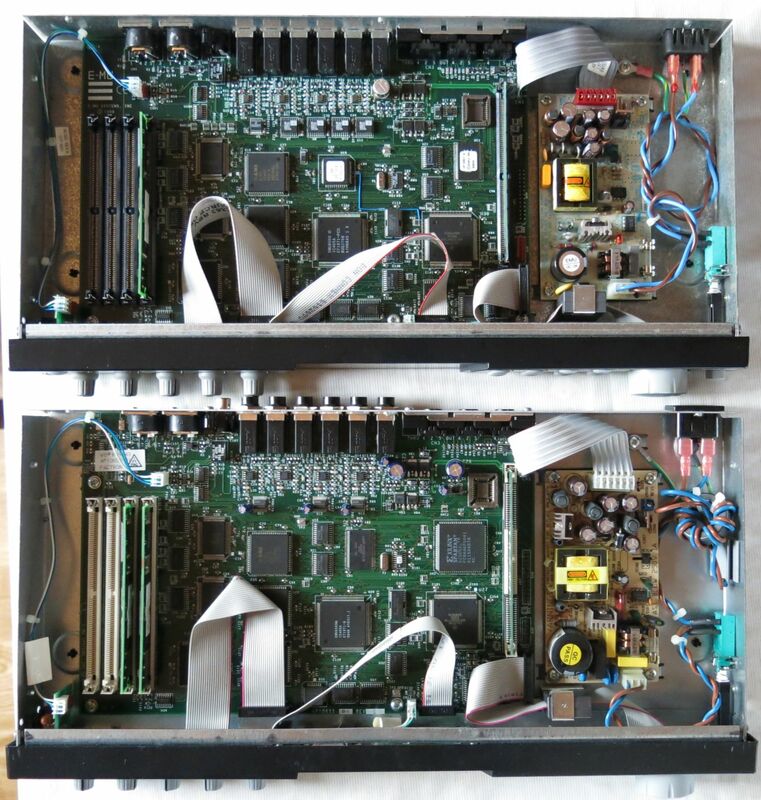 Later I’ll take the lid of an Extreme Lead 1 and Orbit 3 to compare with these 2000 boards. Please revisit. Being the last hardware incarnation with DNA from the Emulator samplers one way of looking at the P2K series is to see it as an accumulation of Dave Rossum work in synthesis from early days of modular synths and being part of what today is considered to be historical highlights of Tom Oberheim, Dave Smits and Ron Dow (SSM chips) careers, towards his work designing affordable high-end end sampling technology evolving in Emulator/Emax/Proteus series over more than two decades. 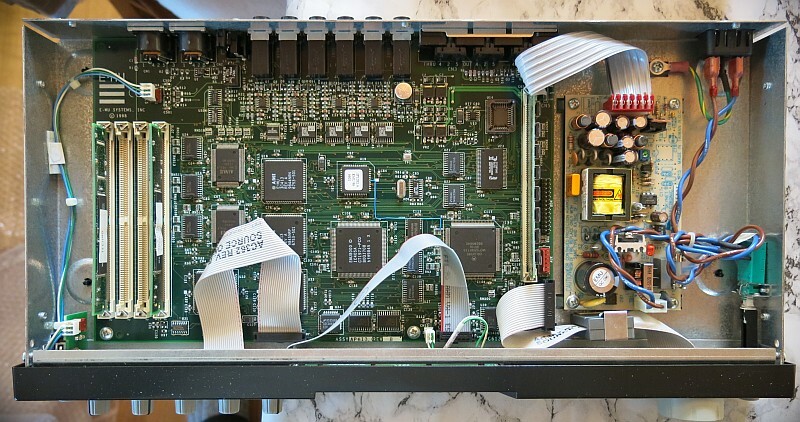 My understanding are that Dave Rossum wasn’t much involved in the actual design of the P2K series, but the machine in itself aren’t anything without its custom algorithms and G and H chips which are results of Dave’s creative work and knowledge. 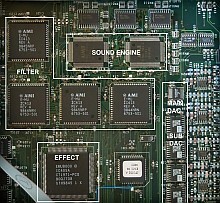 Under the hood P2K utilize all the custom DSP synthesizer chips from the Ultra series samplers released the same year. My initial love for the P2K started when I realized I had much of the power from my Emulator’s with zero loading time of standard E-MU sound libraries and no noise from hard drives or power fans. 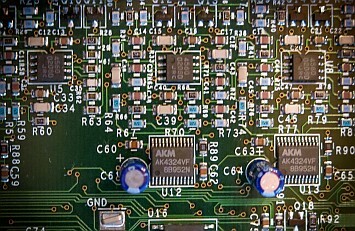 The G-chip is what made the Proteus its success from 1989 onwards. Although the Z-plane filters what’s first comes to mind when one hear the E-MU name mentioned the main reason for the great sound E-MU got its reputation for in the 90’ came from the synth engine stacked in this G-chip, responsible for pitch shifting samples. While most low cost vendors used speed manipulation at playback to shift pitch E-MU went to great length to develop custom chips and algorithms for more natural sounding sample playback. G-II found in P2K have better resolution and fine-tuned algorithms for best possible reproducing of the original sample. In discussion about changes in Emulator IV series Dave Rossum mention this more accurate and detailed reproduction can in some instances be perceived as sounding slightly brighter than from older G-chips. 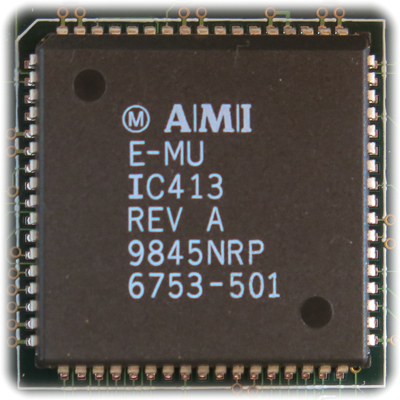 EMU8000 chip in P2K used for dual 24-bits effect engine do actually have a cost reduced G-chip pitch shift technology inside, bypassed in P2K though. This chip originally where developed for cheap Creative sound cards. 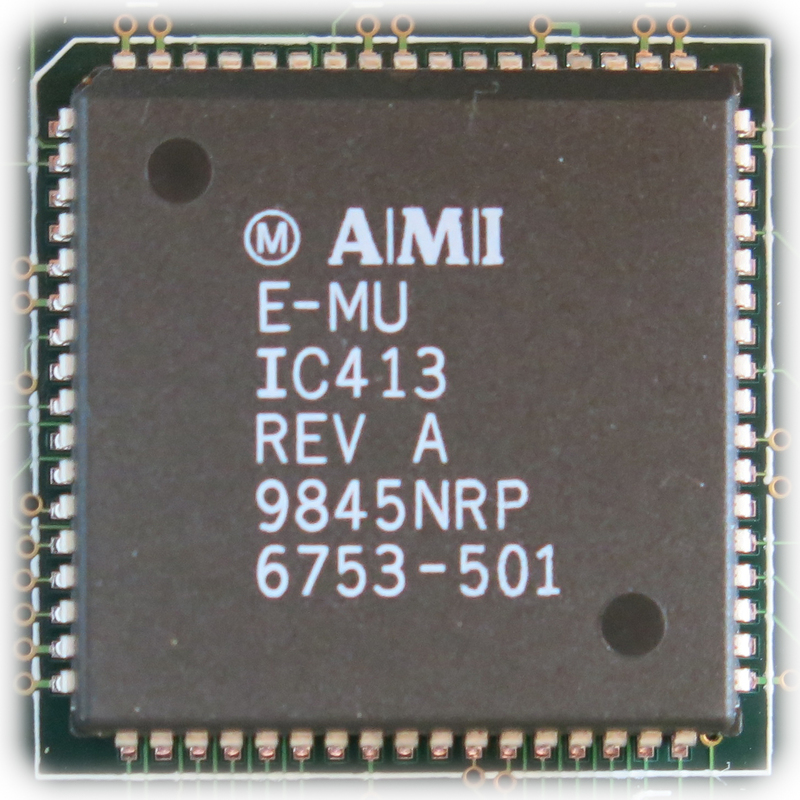 The story as Dave Rossum tell it, EMU8000 found its way into E-MU products somewhat reluctant, but the team gave in as it sounded better than the 16-bit chip/algorithm (AD2105) E-MU used in earlier models, combined with very low cost. 1000 series are cost down versions that for some models actually made sense. One can argue how many analog outputs and voices are needed to simulate a B-3 organ? Initially there were differences between functionality in operating system for each model, like patterns and riffs. And typical for its time period major upgrades were not free. Now all models can run version 2.26 and have identical functionality expect for any hardware limitation and content on ROM modules (see table below). It’s easy to spot the physical differences by looking at the back of the unit. Proteus 1000 series units are missing connectors for S/PDIF, SUB 1, SUB 2 and MIDI B (channel 17-32). - P1K have 64 voices compared to P2K’s 128 voices. 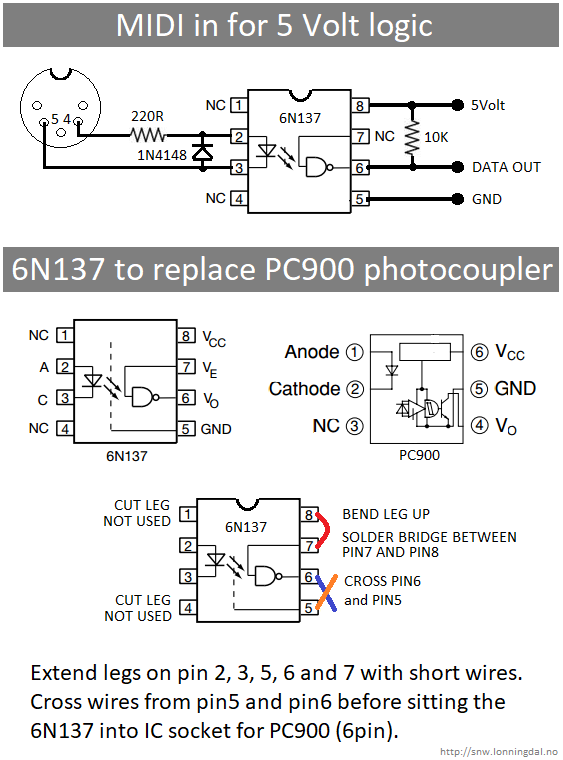 - There are only two filter chips and a single sound engine chip. - Two PCM/preset ROM can be mounted, including the factory card leaving only one slot for expansion. - 4MB of DRAM vs 8MB in P2K, presets from all SIMMS modules are loaded into DRAM at boot time. When ordering synth new from factory there where an option to order what normally where P1K units with P2K mainboard. Often referred to as Turbo upgrade. E-MU also released a few Turbo models with dedicated user manual like XL-1 Turbo, however content on ROM for this version seems identical to the P1K release. Most keyboards from this generation are P1K, and Command Stations where build with P2K. 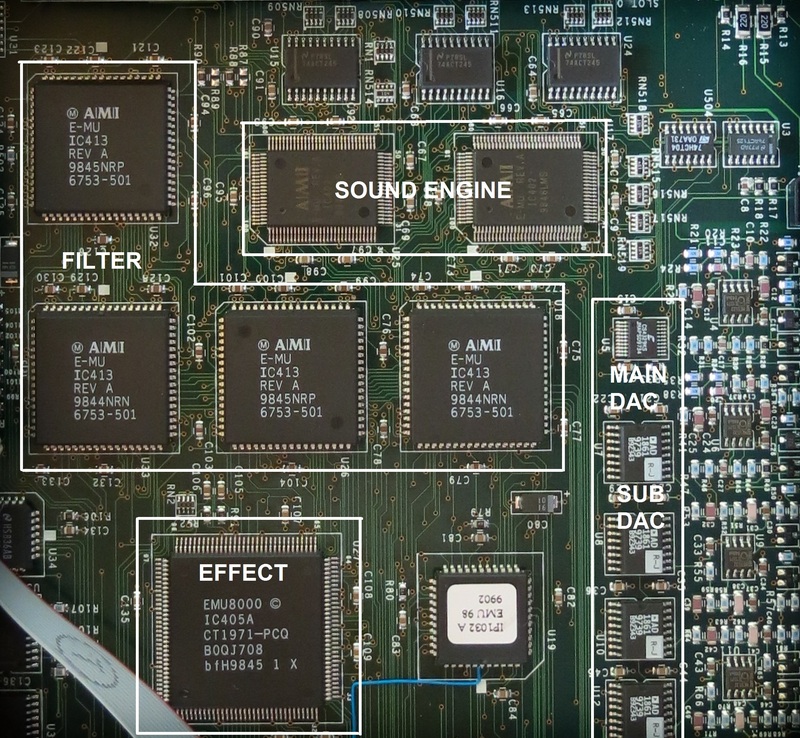 It’s not clear if the missing filter/engine chips have impact on sound design other than voice limitation. Any sound using chorus or 12th pole filters steal one voice for each layer it is activated on. If used on all 4 layers P1K still have 16 voice polyphony availably to morph through presets. Luckily it is super easy to upgrade over MIDI with E-Loader, if you have an old computer that is. Use correct file for Proteus 1000 or 2000 series. Both are present in this zip bundle with E-Loader v.1.11. Update January 2019 — Ray Bellis has made an online E-loader to simplify this process using modern computers. User manual rev B (paper version) only list seventeen 2th/4th/6th pole filters P2K originally where released with in 1999. Previous generation, the 32 voice Orbit 2, Carnaval etc. also had 17 filter presets. Thirty three new 12th pole filters came with firmware version 1.10 the following year, giving a total of 50 filters as listed in the corresponding addendum. User manual rev E list all 50 filters from PDF page 113, printed page 105. 12th pole filter use two 6th pole filtered voices in series for each layer they are applied to, quickly cutting polyphony, - hardly a problem for today’s users. While a 4th pole digital filter emulating analog LPF can be equivalent to a 24dB LPF, poles in digital filters are utilized very different than in the analog domain, so don't be fooled to visualize a +/-6dB slope for each pole. Interestingly E-MU use the term filter presets about these filters. Meaning “to simplify use of the device user are not allowed to configure their own DSP filters?” Morpheus released 6 years earlier had 197 filter presets and Ultra Proteus crazy 288 filter presets, it’s clear E-MU must had a vision they needed to simplify the user interaction with the advanced feature sets of the Z-plane technology. Proteus 2000 series comes standard with 384, 512, 640 or 1024 ROM presets (depending on SIMM module) and 512 editable User preset locations. Presets are organized into banks of 128 presets each. Two types of memory storage are possible in P2K. ROM (read only memory) like all factory sound modules, and Flash that can be written to by user (with limitation). 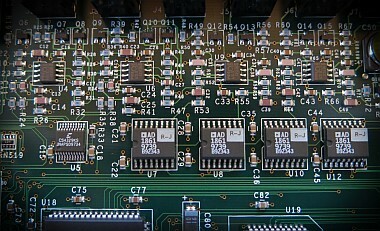 Either of these memory chips are soldered on a small printed circuit boards (PCB) called SIMM (single in-line memory module). 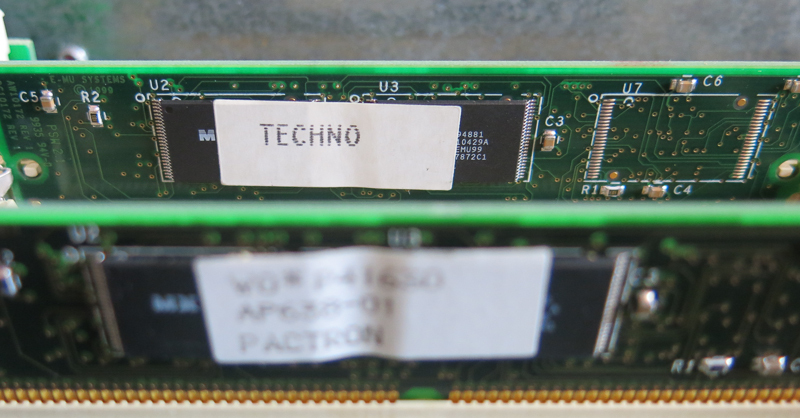 Both memory types are seated in one of the four (two for P1K) common SIMM sockets on the main board. 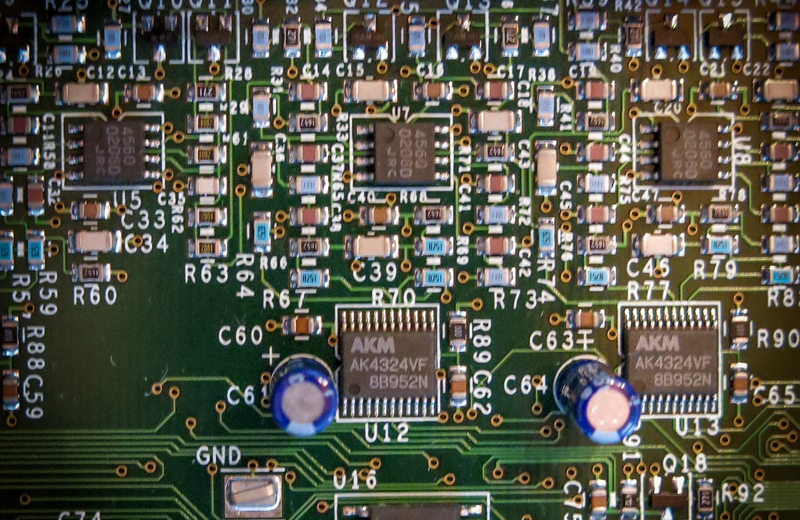 Technically the term SIMM are more correct to use when referring to these PCB containing raw samples, presets and riff/beats as each SIMM contain multible ROM or Flash chips. It is possible to test SIMM modules from the Diagnostic menu. To enter Diagnostics hold both arrow keys when powering up unit. 17 pop collection PK-6 Proteus Keys 1K 5 / 529 Riff 1173 PROM1 9140 Identical raw waveforms as CMPSR and P2500 but has different riffs and beats. 20 composer Proteus 2500 2K 4 / 63 Pattern / 469 Riff 1173 P2500 Identical raw waveforms as CMPSR and PROM1 but has different riffs and beats. Some presets altered to utelize these. When SIMM modules are added to P1K/P2K banks of SIMM presets are also added according to table. But User space are still "limited" to 512 presets, 4 banks of 128 presets. With E-MU Emulator IV Ultra series samplers one could blow empty flash ROM’s for use in P2K. The Sound Authoring Operation Manual show how to do this. Actually it's possible to copy flash modules inside P2K, but not from factory ROMs that are copy protected. Today we can buy an Ultra sampler for less money than these empty flash SIMM modules would cost 17 years ago. Sadly this outdated technology haven’t dropped much in price so cheapest way to use custom samples are to clear 3U space in your rack for an Emulator sampler of some kind. Each of the four layers can have 24 patch cords connecting internal modulation, real-time controls, synch and triggers to desired destinations. Each patch cord even has its own attenuator control that also can be modulatet or triggered from any sourche. As with any good modular synth setup P2K come with several utility modules, hidden I the PACHCORD configurator from where one can use them as modulation or trigger sources after first patching something into them. All the modulation inputs on P2K act as summing nodes, capable of multiple modulation sources from the PATCHCORD configurator. The front panel 4 by 3 Control Knob matrix can be thought of as front panel MIDI controllers because in the Proteus 2000, they are treated just as if they originated from an external MIDI device. They can be routet at will and data can also be send over MIDI port to external gear for performance recording or remote control. 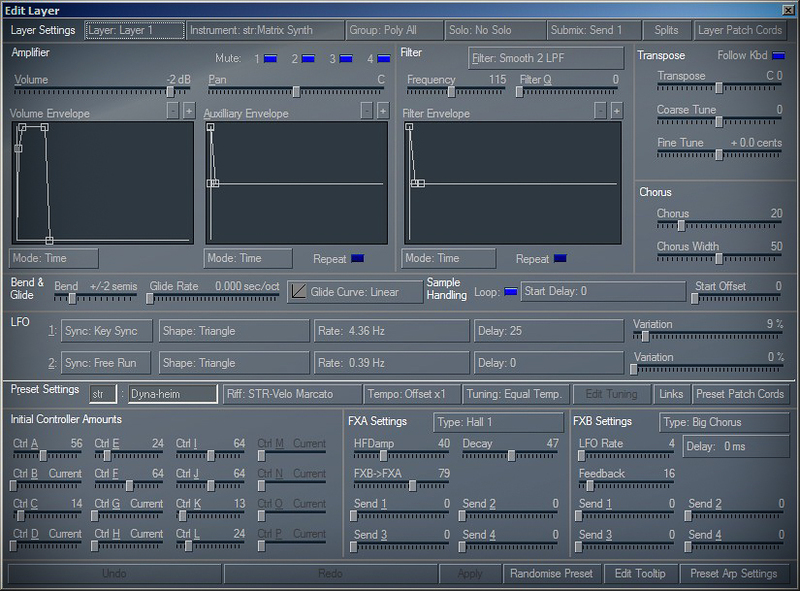 Remember all of these waveforms can be altered furder by patching modulation and clock sync to reset the LFO. There are a total of 8 LFO's for each four layer voice. What is a Z-plane filter? "A Z-plane filter is a filter which can change its function over time. In a Z-plane filter, we start with two complex filter types and interpolate between them using a single parameter. See the following diagram." 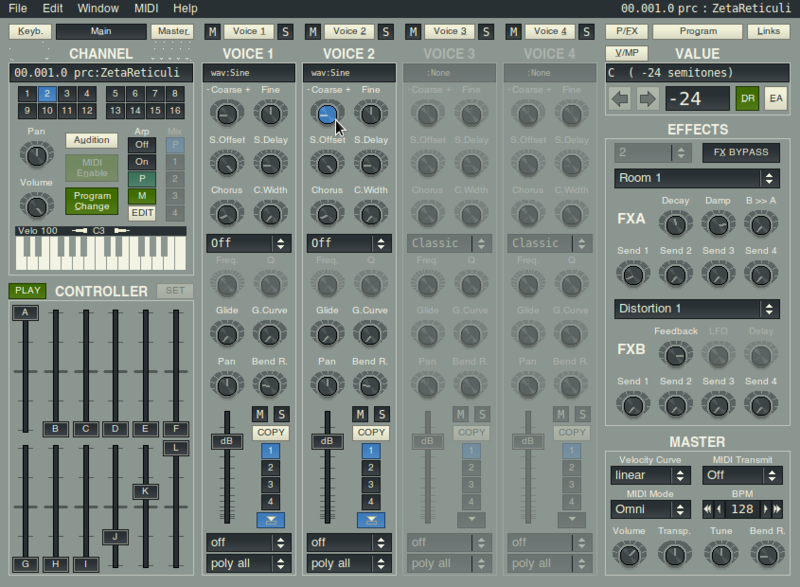 Changing a single parameter, the Morph, changes many complex filter parameters simultaneously. Following along the Morph axis you can see that the filter response smoothly interpolates between the two filters. This is the essence of the Z-plane filter. Through the use of interpolation, many complex parameters are condensed into one manageable entity." "Proteus 2000’s filter chips can implement 128 filters of 2nd to 6th order complexity or 64 filters of 12th order complexity." 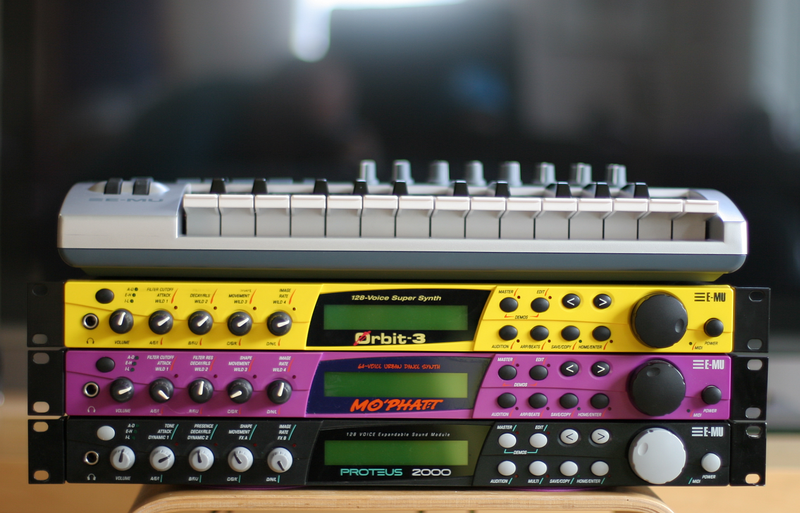 Is Proteus 2000 a true Z-plane synthesizer? Sure it is. It has genuine Z-plane filters, even with better specifications than model's commonly thought of as Z-plane synthesis. But it will never sound as a Morpheus or UltraProteus when they utelize 2 by 4 filter frames. Operating system take a few different approaches when it comes to sound design. Important to understand about Z-plane-plane filters used in E-MU hardware synth devices. One can easily be misled to believe morphing can be done between user selected filters. Truth is, all morphing is done inside a single ready made filter preset stored i ROM. 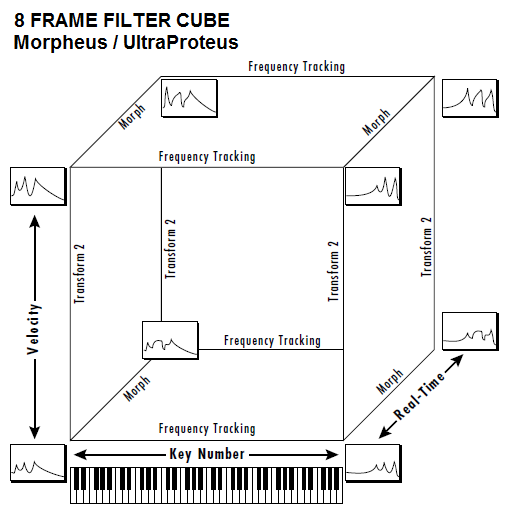 To clearify, user only select a single predefined filter preset by name, that preset being constructed by 1,2 or up to 8 filters frames for Morpheus and UltraProteus. Architecture in newer Proteus modules let go of the advanced filter presets first seen in Morpheus, the Z-plane monster from 1993. 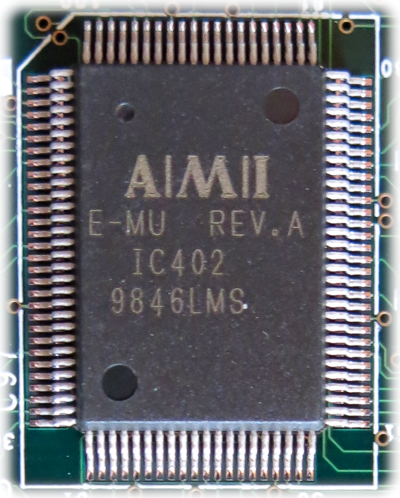 E-MU found a different way of unleashing the power of the H filter chip after UltraProteus. H filter chips are by hardware design capable of morphing two filter frames for each filter as explained above. This is true for all Proteus models including Morphius/UltraProteus. User manual will have you think of them as 2-dimensional. While P2K let user crossfade and modulate 4 layers (instruments) for evolving and crazy filtered soundscapes with 230300 unique 2-dimensional Z-plane filter preset combinations (50C4) the Morpheus can have up to four 2-dimensional predefined filters in one of its 197 filter presets. What set the Morpheus apart are that E-MU introduced a third control parameter to define a “position” in-between these filters. This third parameter can be modulated, but it becomes a fixed value from note-on while the 2-dimmensjonal part of the (up to) four Z-plane filters continuous do frame transition according modulation schemes, as it also does for the four layers in the P2K. Each preset in Morphius and UltraProteus can do 2 layers but as the P2K it steal voices for higher order filters more quickly draining on its 32 voice capacity. Andrew Simper (Cytomic) analyses of the Z-plane filter in 2016 revealed it as a Direct Form 1 Biquad Filter (second-order recursive(feedback) linear filter, containing two poles and two zeros) that can be chained to form multiple filter responses. When UltraProteus claims to have 288 filter presets, that’s more accurate than first assumed as it utilize only one filter technology but chain this filter differently in multiple presets. Now three decades later with modern computer power and experience linear DF1 biquad filters are probably no longer the first chose when aiming for high quality analog filter emulation. Some filters presets in early Z-plane devices are with varying success replicated in the effect section in later Proteus models. For monophonic sounds it's probably less obius to spot how they "cheated". In Greek mythology Proteus is the prophetic old man of the sea and shepherd of the sea’s flocks (e.g., seals). Proteus knew all things—past, present, and future—but disliked divulging what he knew. Those who wished to consult him had first to surprise and bind him during his noonday slumber. Even when caught he would try to escape by assuming all sorts of shapes. But if his captor held him fast, the god at last returned to his proper shape, gave the wished-for answer, and plunged into the sea. Would that imply we should read the manual before delving into the P2K? In addition to realtime controls like keys, wheels and foot switches each layer have 12 MIDI inputs, MIDI A-L that can be patched to any destination. Patched through helper modules in the PATCHCORD trigger can be created. A simple Arduino developer board could sample voltages from a modular synth or analog drum machine and convert to MIDI messages for integration with P2K's PATCHCORD. Enabling Chorus in Layer Parameter work by duplication the layer using yet another voices to create the detuned chorus layer. In contrast to how the effect section will sample a copy and alter tuning on the sample activating it on the layer will make a true duplicate of the sound using the synth engine. Used to be a popular trick to fatten sounds on the IV sampler in its heydays. Controls are Chorus detune (off/1-100%), and Width is the stereo spread (0-100%). Smooth 02 LPF Typical OB type low-pass filter with a shallow 12 dB/octave slope. Classic 04 LPF 4-pole low-pass filter, the standard filter on classic analog synths. 24 dB/octave rolloff. Steeper 06 LPF 6-pole low-pass filter which has a steeper slope than a 4-pole low-pass filter. 36 dB/octave rolloff! MegaSweepz 12 LPF “Loud” LPF with a hard Q. Tweeters beware! EarlyRizer 12 LPF Classic analog sweeping with hot Q and Lo-end. Millennium 12 LPF Aggressive low-pass filter. Q gives you a variety of spiky tonal peaks. BassBox-303 12 LPF Pumped up lows with TB-like squelchy Q factor. Shallow 02 HPF 2-pole high-pass filter. 12 dB/octave slope. Deeper 04 HPF Classic 4-pole high-pass filter. Cutoff sweep progressively cuts 4th Order High-pass. Band-pass1 02 BPF Band-pass filter with 6 dB/octave rolloff on either side of the passband and Q control. Band-pass2 04 BPF Band-pass filter with 12 dB/octave rolloff on either side of the passband and Q control. ContraBand 06 BPF A novel band-pass filter where the frequency peaks and dips midway in the frequency range. Swept1>1oct 06 EQ+ Parametric filter with 24 dB of boost or cut and a one octave bandwidth. Swept2>1oct 06 EQ+ Parametric filter with 24 dB of boost or cut. 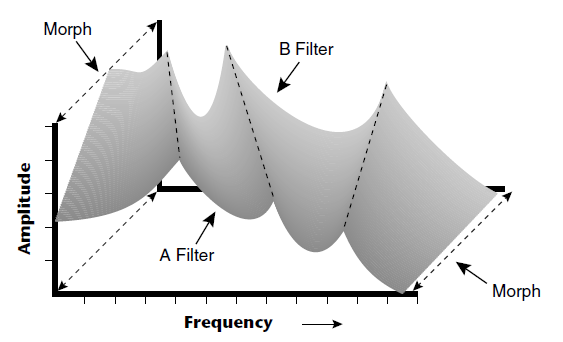 The bandwidth of the filter is two octaves wide at the low end of the audio spectrum, gradually changing to one octave wide at the upper end of the spectrum. Swept3>1oct 06 EQ+ Parametric filter with 24 dB of boost or cut. The bandwidth of the filter is three octaves wide at the low end of the audio spectrum, gradually changing to one octave wide at the upper end of the spectrum. DJAlkaline 12 EQ+ Band accentuating filter, Q shifts “ring” frequency. BolandBass 12 EQ+ Constant bass boost with mid-tone Q control. BassTracer 12 EQ+ Low Q boosts bass. Try sawtooth or square waveform with Q set to 115. RogueHertz 12 EQ+ Bass with mid-range boost and smooth Q. Sweep cutoff with Q at 127. RazorBlades 12 EQ- Cuts a series of frequency bands. Q selects different bands. AahAyEeh 06 VOW Vowel formant filter which sweeps from “Ah” sound, through “Ay” sound to “Ee” sound at maximum frequency setting. Q varies the apparent size of the mouth cavity. Ooh-To-Aah 06 VOW Vowel formant filter which sweeps from “Oo” sound, through “Oh” sound to “Ah” sound at maximum frequency setting. Q varies the apparent size of mouth cavity. MultiQVox 12 VOW Multi-Formant, Map Q To velocity. Ooh-To-Eee 12 VOW Oooh to Eeee formant morph. TalkingHedz 12 VOW “Oui” morphing filter. Q adds peaks. UbuOrator 12 VOW Aah-Uuh vowel with no Q. Raise Q for throaty vocals. DeepBouche 12 VOW French vowels! “Ou-Est” vowel at low Q.
PhazeShift1 06 PHA Recreates a comb filter effect typical of phase shifters. Frequency moves position of notches. Q varies the depth of the notches. PhazeShift2 06 PHA Comb filter with slightly different notch frequency moving the frequency of notches. Q varies the depth of the notches. FreakShifta 12 PHA Phasey movement. Try major 6 interval and maximum Q.
CruzPusher 12 PHA Accentuates harmonics at high Q. Try with a sawtooth LFO. FlangerLite 06 FLG Contains three notches. Frequency moves frequency and spacing of notches. Q increases flanging depth. DreamWeava 12 FLG Directional Flanger. Poles shift down at low Q and up at high Q.
MeatyGizmo 12 REZ Filter inverts at mid-Q. DeadRinger 12 REZ Permanent “Ringy” Q response. Many Q variations. ZoomPeaks 12 REZ High resonance nasal filter. AcidRavage 12 REZ Great analog Q response. Wide tonal range. Try with a sawtooth LFO. BassOMatic 12 REZ Low boost for basslines. Q goes to distortion at the maximum level. LucifersQ 12 REZ Violent mid Q filter! Take care with Q values 40-90. ToothComb 12 REZ Highly resonant harmonic peaks shift in unison. Try mid Q.
EarBender 12 WAH Midway between wah & vowel. Strong mid-boost. Nasty at high Q settings. FuzziFace 12 DST Nasty clipped distortion. Q functions as mid-frequency tone control. BlissBatz 06 SFX Bat phaser from the Emulator 4. KlangKling 12 SFX Ringing Flange filter. Q “tunes” the ring frequency. Of the three envelopes available only DCA (volume envelope) are hard wired. The filter and auxiliary envelopes are manually patched by user. Attack, decay and release can all be modulated. All three envelopes can be either time based from 1 ms to 160 seconds, or locked to master tempo where user select note length for each step in the envelope. Any envelope step set to 0 (zero) are ignored. Envelopes can be looped between steps as shown above. If Release 2 are set to a long decay time it will drone until all voices are used. From sound menu one can delay start of the layer (instrument). Turning CW select values from time domain, turning CCW select note length. If your ever wondered how many possible combinations there are with a given synth configuration there are several online Combinations Calculator (nCr) to help out. Let's say you're curios how many unique patch combinations you can create with P2K's 64 modulation sources and 24 patch cords. This calculation are typical representet as 64C24 combinations = n! / r! (n - r)! return 250649105469666120 combinations. Actually the theoretically number are even higher if utilities modules are also patched in. Number of practical patch configuration are of course more limited. This example 50C4 show number of unique filter preset combinations that can be done with a four layer preset and fifty filter presets. Feel free to try out a few other combinations. What about 8 voices, all with unique filter combination 50C8. Mathisfun have a nCr calculator that even create lists for you if you like to document settings tested. Page last updated: January 06 2019 14:13:49. Have discovered that some ORCH1 presets require samples from ORCH2 and vice versa, so these ROMs need to be installed as a pair of you want all the presets to work. If you only install ORCH1, about half the presets will display their names but have no sound.